As I was walking home yesterday, I found myself sharing the sidewalk with a young man in a UPS jacket. As I passed by, I said hello. As we continued to walk we started to chat. He was on his way home from work. He got to talking about his work in a UPS warehouse where packages are unloaded, sorted and put on the proper conveyor belts, and loaded up again. The more we talked, the more excited he got, telling me all the complexities of getting packages from point A to point B on time with no mistakes. I found out that the holiday season actually starts well before Thanksgiving. (Who gets their shopping and shipping done that early?!) Although he has moved up the ladder from doing the package handling himself to supervising people who do, he has to jump in and help sometimes, and is proud that he still has his package handling mojo. He told me how many packages he oversees in a day. I had so much fun talking with Robert. He was so clearly engaged in and proud of his job. He told me at work they call him the goat. Goat? I thought I misunderstood. Goat, he said. An acronym G-O-A-T. I tried to guess. He let me fumble around for a minute, building suspense, then puffed out his chest and said with glee, Greatest Of All Time. We finally had to part ways, but I was so charmed by Robert that I called UPS and tried to find someone who would know who Robert is. I eventually was put in touch with a supervisor. I told her that UPS is very lucky to have employees like Robert out there representing their company. I suggested that UPS should be using Robert in their commercials. My chat with Robert was the best advertisement for any company I have ever seen. I have been thinking about Robert a lot today. Do I do whatever task I have to do, at work or elsewhere, with that much pride and enthusiasm? Would anyone call me the GOAT? Well maybe a goat, but the GOAT? I just read an article in O, the Oprah Magazine, about awe. Apparently, feeling a sense of awe is good for our health, both physical and emotional. Awe releases feel good chemicals in our brain that spur us to connect with others. When we experience something that amazes us, our first response is to feel good. Our second response is to want to share it with others. For example, the article said that the most emailed NY Times articles are not about oil spills and terrorism; the most emailed articles are inspirational, like articles about discoveries in space and stories of heroism or courage or generosity. Most of us have our own personal guaranteed awe triggers, like gazing at the Milky Way or watching our children sleeping. And then there are specific events that make us stop and say, “This is amazing.” For example, the trapped miners getting rescued in Chile. Or the pictures someone emailed me recently showing some young cheetahs chasing a baby antelope. When they caught it, they just played gently with it. The pictures show them licking it like a mother licking her cub, and the antelope nuzzling its deadly enemies. Then they all walked away to hunt and run another day. Closer to home, I was up at my cabin this weekend. While I was out walking, it started snowing those big fat cottony flakes. The forest was so quiet I could hear the flakes softly ticking as they landed. So exquisitely beautiful. The article made me realize how often I rush past awe. I don’t look up at the stars. I don’t pause to delight in the wonder. I don’t bother to share my discovery with someone. I am going to use my word of the year, attend, as a reminder in these last weeks of 2010 to savor and share the awe. What are your guaranteed awe triggers? What has amazed you recently? I had the good fortune to live and work in Bangkok many years ago. I was the only American in my office, and of course Thanksgiving is not a Thai holiday, so when Thanksgiving came, I took the afternoon off to go have dinner with other Americans. I knew then I had a lot to learn! No matter where you are in the world, Happy Thanksgiving! Thanksgiving is my favorite holiday. I love the idea of a day set aside to share food and companionship with others as we celebrate gratitude. There is no big commercialization of Thanksgiving – witness the shift in the stores from Halloween directly to Christmas. Thanksgiving’s value to the consumer society is only in its passing to the shopping extravaganza of Black Friday. So I love this day. I don’t have to buy presents or send out cards. I don’t have to fight crowds in the mall. I just get to be grateful. So why don’t I feel more grateful this Thanksgiving? I can rattle off numerous blessings, big and small. By most anyone’s standards, I haven’t a care in the world. And yet my heart is heavy. Perhaps because people near and dear to me are approaching this holiday season without loved ones who have recently died – a young husband and father, a wife of many seasons, a daughter. Perhaps because our political leaders continue to engage in tactics and rhetoric that would be comical if they weren’t so destructive. Perhaps because I know that last night as the temperature plummeted, there were homeless people in my neighborhood looking for a place to stay warm and dry, or perhaps to just stay alive. So how can I take this heaviness and find the gratitude in it? I can be even more humbly grateful for the blessings I have, knowing how fleeting and precious our treasured moments are. I can be grateful for awareness of other people’s suffering. I can be grateful for an open heart to feel compassion. I can be grateful for the abundant resources I can share through contributing to shelters and food banks. I can show my gratitude by saying thank you to as many people as possible. And I can tell the people who bless my life how much I love them. I hope that all of you find joy in this holiday of thankfulness. I would like to share a blessing that someone sent to me recently. After a hectic, anxiety-filled week, I enjoyed having a quiet day at home watching football and cleaning house during the commercials. I was in no hurry so I got to all those places we often overlook – the baseboard, tops of pictures, and under the couch where I found, not surprisingly, extended families of dust bunnies. That got me to thinking about my spiritual life. (Hold on – there is a connection here.) Lately, it seems like things long forgotten have resurfaced in my awareness, seeking attention. Things that have apparently been living quietly for years in dark places, hidden from sight, like dust bunnies of the soul. Traveling along most any inner path seems to involve, at some point, dealing with things we would rather forget, things that bring us shame or guilt or pain or fear. Although we might hope that our path would bring total peace of mind and heart, we can’t seem to get there without becoming friends with the demons we’ve kept locked in the basement as well as the less scary dust bunnies in the corners. Whether we experience it as the dark night of the soul, the unfolding of the lotus, or addressing our therapeutic issues, we finally realize, as Pema Chodron says, the wisdom of no escape. We come to a place where making the changes we need to make in order to have a better life is less terrifying than doing things the way we always have. And so we set about to clean house. We turn the light on in the basement, we slide the Swiffer under the couch, we throw away the unidentifiable stuff in the back of the refrigerator. And when everything is sparkling clean, we try to keep it that way as long as possible. But you know and I know that those dust bunnies will start to reproduce again. We don’t live in a sterile world, not on the outside nor on the inside. Life is messy. So we can begrudge the periodic need to get out the cleaning supplies, or we can make peace with the rhythm of our lives, knowing that living and loving means muddy pawprints across the floor I just mopped. When I read this, I feel even more strongly the urgency of developing habits to support a joyful spirit. The need, as Buddha said, to practice like my hair is on fire. Every now is here and gone so quickly that we don’t have time to plan it before it has vanished. And once it is gone, it’s gone. We don’t get to rethink that thought, resay those words, redo those acts. So our habits are crucial to the quality of our moment by moment experience of now. I’ve read that 40% of our happiness is based on our habitual thoughts, feelings, words, and actions. 50% is based on our natural temperament. Only 10% is based on outer circumstances. That puts a walloping 40% in our total control. And that 40% is based on habits, our default ways of interacting with our world. Deciding to be joyful is an impossible task. But changing and developing habits is manageable. We can do that. We can choose to develop habits to grow and maintain a deep, abiding happiness. We can max out that 40%. We can’t do over all the nows that have already gone past. Let them go. But we can use this present now to shape and create habits that will lead to future nows of joy. Let's make every now count. My two autistic sons live in a group home for adults with developmental disabilities. It is a modest home by anyone’s standards, funded primarily by the clients’ government benefits. They do not have lives of privilege or abundance in material things. In the aftermath of the crazed scramble for a retirement/severance package (see last post), I have been reflecting on James’s words this week. One might not expect profound wisdom from the mouth of a young adult with autism, which just proves that we need to be open to truth from any source. Notice that James didn’t say he has everything he needs, which would certainly be true. He went further to say that he has everything he wants. How many of us can say that? How many of us do say it? Make no mistake, James does want things. A new DVD, a hamburger and fries with root beer, a trip to the library. So what did he mean? I think he meant that he has everything he wants in order to be happy. I think he recognized that his happiness was complete whether he has certain “things” or not. His statement was one of utter contentment and appreciation. May we all live in our treasurest place and have everything we want. Buddha taught that the cause of suffering is attachment. When we are attached to a particular outcome, when we desire things to be other than what they are, when we crave something we don’t have or fear losing something we do have, when we seek to control what we can’t control, we suffer. As Sylvia Boorstein writes, life’s challenges are inevitable. Suffering is optional. The last few days have been the perfect example. I’m planning to retire. I have been thinking about it for awhile, and for many reasons, the timing is right. Just as I was poised to tell my supervisor that I was ready to retire, my workplace offered a generous severance program to certain eligible employees, including me. This is a one time offer for the purpose of cutting back on staff to address budgetary concerns. The funds for the offer are limited, so not all employees who are eligible will be able to get in the program. The funds will be allocated during a six week window on a first come, first served basis. The window opens Monday morning. Speculation and anxiety are rampant. Will people be lining up during the night like folks trying to get tickets to a rock concert? What time should I be there? What if I don’t go early enough and miss my chance? What if people try to save places in line for other people? What if, what if, what if...? So for the last several days, I have been plotting my strategy. I couldn’t sleep last night. My mind was too busy playing out all the “what if” scenarios, all ending with the crushing dread, “What if I don’t get the money?” I felt stressed and anxious and overwhelmed with greed. What happened to my happy place? Apparently, I am willing to sell it for the right price. For even the possibility of the right price. I woke up knowing I needed a reality check, so I drove up to my cabin for the day and had some quiet time by the creek. Sure, I want the money. All of us who are eligible and ready to retire want it. Wanting it is understandable. But I’m not more entitled to this money than any other eligible person. And why have I conditioned my happiness on getting it? If I don’t get it, I have not lost one penny. I’m exactly where I was before I knew about the program. No one is taking anything away from me. If I was happy with my plan to retire without the severance package, then why would my happiness be affected by not getting it? So here is my challenge to myself. Can I line up with everyone else, understanding that we are all connected by our hope? Can I see everyone as a child of God instead of some enemy trying to cheat me out of something that isn’t even mine? If I am lucky enough to get the money, can I feel compassion for those who don’t? And if I don’t get the money, can I allow myself a moment of disappointment and then walk away, happy for those who did and knowing I am still blessed beyond belief? I hope so, for my sake. Of all the steps discussed in this blog, it seems that forgiveness (step 8) is one of the hardest. The foundation of so many teachings, and the subject of endless writing, it remains one of the most challenging to accomplish. Even the concept is hard to grasp, like a squirming, slippery fish. Forgiveness sometimes masks judgment. As in, I forgive you because I am a better person than you. Or lack of compassion, as in, I forgive you because I want you to feel bad. And even when we genuinely forgive someone, sometimes the forgiveness doesn’t stay put. As in, I know I forgave you for this, but I was remembering what you did and now I’m all upset again. I recently stumbled across a new perspective on forgiveness. I was talking with a friend about a person who had wronged me years ago in a major way. It doesn’t matter who the wrongdoer was, so I’ll just call this person Jane. I held such bitterness towards Jane for so long that I knew it was poisoning my whole life. So I set out to forgive Jane. I would like to tell you that my motivation was that I wanted to be a good person, but really I just wanted relief from the choke hold the resentment and blaming had on my life. I worked hard in therapy, I completed forgiveness workbooks, I went to healing services, and I prayed. And gradually I forgave. And for the most part it stayed put. I went on with my life, free of the chains I had dragged around for so long. But as I was relating all this to my friend, something started nagging at me. Later, still reflecting on this vague uneasiness, I had a lightbulb-turning-on epiphany. I realized that I had only completed half the work of forgiving. I still saw myself as the “innocent” party in this story. But was I? I had heaped judgment and blame on Jane. I had wished unpleasant things for her. And I had completely denied my own contribution to the escalation of the enmity between us. It was my own reaction to what had happened that created such a monster that forgiveness took so long and required so much effort. And so in my heart I asked Jane for forgiveness. It wasn’t easy. I didn’t like admitting, even to myself, the things I had thought and said and done. Humbling, to be sure. So I’m wondering if I have stumbled onto a shortcut to forgiving others. Giving forgiveness is easier if you are also asking for forgiveness. Now, when I catch myself feeling wronged, in even some small way, before I get too invested in the story of someone else’s shortcomings, I try to stop and ask forgiveness for the separation I am creating by my own thoughts. I’m finding that it is very difficult to ask for forgiveness and judge someone at the same time. So the bonus is that not only am I able to forgive more easily, but I’m less quick to judge (step 6). A twofer. There is a dry erase message board in the ladies room at work. Usually, it is filled with notices of meetings and other announcements. Today, however, it had only one message. "Hey! Hey! We're so lucky it's Tuesday! Have a great one!" That it was written on a dark, rainy, windy, cold Tuesday makes it all the more cheery. We are lucky indeed. Our planet is in great trouble and if we keep carrying old grudges and do not work together, we will all die. Before you read any further, guess who said that. Was it said by a Democrat after the recent election? A peacemaker in the Middle East? Al Gore in An Inconvenient Truth? Any other guesses? Give up? It was Chief Seattle. Have you ever noticed how some of the greatest advocates for forgiveness are among those who have the greatest reasons to remain bitter? Nelson Mandela forgave his jailers and healed his country through truth and reconciliation. There are many stories of Holocaust survivors who refused to hate, of POWs from Vietnam who went back and met with their captors, of victims of horrific crimes who forgave the perpetrators. And then there’s me. When I was a girl, I was playing ball one day with the neighbor’s children in their front yard. I believed one of the kids was cheating and I called him out. His siblings came to his defense and the shouting quickly escalated. I was relieved when my mom came outside to see what the fuss was about, certain she would take my side. Instead, she suggested that I apologize and that we go on with our game. When I refused, she issued an ultimatum – either I would apologize, or I could never play with these kids again. I had only one sibling, and she was older by too many years to be a playmate for me, so my social life depended on the kids in the neighborhood. Nevertheless, without a moment’s hesitation, I stood my self-righteous ground ... and I never played with, or even spoke to, any of those kids again. I mean really. I just shake my head when I think about it after all these years. And yet, if I think a little more, I bet I can come up with some folks that I am holding a grudge against right now in righteous unforgiveness. What about you – can you think of anyone? Is it worth it? As I was driving to visit my sons today, I noticed a woman in a wheelchair on the sidewalk next to a van parked at the curb. The van had a ramp that was partially unfolded, but seemed to be stuck. The woman held something in her hand – I couldn’t tell if it was a control for the van or perhaps a cell phone. As I passed by, I looked for a driver or someone nearby who might be helping her, but I saw no one. I continued another block or two wondering whether an offer of help would be appropriate or an unwelcome intrusion, and also thinking of the time since I was already late. But that little voice was poised to start nagging, so I circled back to see if she was still there. Sure enough, nothing had changed. I pulled over behind her van, got out, and asked her if she needed some help. Yes, she said. If I could just pull the bottom section of the ramp out, it would flatten out. It was easy enough to do, requiring only a gentle tug. The ramp had gotten stuck on a small pile of autumn leaves. I asked her if she needed further assistance to get in the van or to get the ramp back up, but she assured me she could do the rest herself. As I drove off, I watched in the rear view mirror as she deftly maneuvered the chair up the ramp and into the van. This woman had a state of the art wheelchair and van so that she could move about independently. A marvel of technology and engineering, providing self-sufficiency and freedom. And yet, it all came to a halt over a few leaves. It took me all of 45 seconds to hop out of my car, unstick her ramp, get back into my car, and drive off. I’ve spent the last several hours thinking about how easy that was for me. In any given minute of our lives, how much do we take for granted? That is the title of a blog I ran across recently. Isn’t that wonderful? It’s fun just to say it. Try it – say it out loud. Ridiculously extraordinary! Doesn’t that make your spirit perk up and your heart sing? I’ve been reading posts and comments on other blogs by women who are struggling to feel good about themselves. That’s all of us, right? Not just women. Where did we get the idea that we are not good enough? Is it our culture? Religion? The Dalai Lama was mystified when someone asked him a question about self-hatred. He didn’t understand the concept at all. And she was. As are we all. More than just right. Ridiculously extraordinary. Complaining is a way of judging. 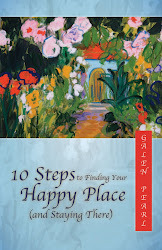 It can become a habit, a habit that does not serve us, that does not lead to our happy place. One way of complaining is “I have to” statements. I have to go to work. I have to cook dinner for the kids. I have to pay bills. How many times a day do I start a sentence with “I have to”? Lots more than I realize, I bet. Think of something you “have to” do. How does that make you feel? When I say “I have to” I feel resistance, like I really don’t want to do it. I might feel resentful or grumpy or powerless or overwhelmed. I’m not likely to do whatever it is with a good attitude. I’m not likely to feel happy about it. But what happens if we change one word? What happens if we change “I have to” to “I get to”? How do you feel now? Instead of I have to go to work, I get to go to work. I have a job when so many people are out of work. I get to be around other people whose company I enjoy. I am paid well for work that I can do well. Instead of I have to cook dinner for the kids, I get to cook dinner for the kids. I have kids whom I adore, and who appreciate a good meal. I have access to healthy food grown by people who work hard to provide me and my family with an amazing variety of delicious things to eat. I have a kitchen full of tools and appliances to help me prepare the food quickly and easily. Instead of I have to pay the bills, I get to pay the bills. I have electricity and water that come right to my home. I can watch my favorite team on cable TV from the comfort of my couch. I can pay for services provided by skilled people who can fix things, paint things, or save me time. All of a sudden, instead of feeling burdened by all the things I have to do, I feel blessed beyond belief by all the things I get to do. How did I get to be so lucky?